Introducing Timebox Photo Galleries, the innovative new version 6.0 of the Timebox Photo Journal! Timebox Photo Galleries is the only app that enables creative photo enthusiasts to design and personalize realistic 3D/AR spaces that their families and groups can use to PRIVATELY combine, organize, explore and enjoy all the photos and stories of the things they do together. We listened to your comments and feedback, added our own ideas, design goals and vision to create a ground-breaking new version of Timebox. The team worked hard, completed the design requirements, performed thousands of tests, fixed bugs, conducted mini Beta tests and have finally decided it's ready for you to try. All 3D models will be free during the Beta test. When Timebox ships the 3D models will be available for free or as In-App Purchase. Explore your Galleries by "walking around" the 3D scenes using the normal iOS gestures to pan and pinch zoom. 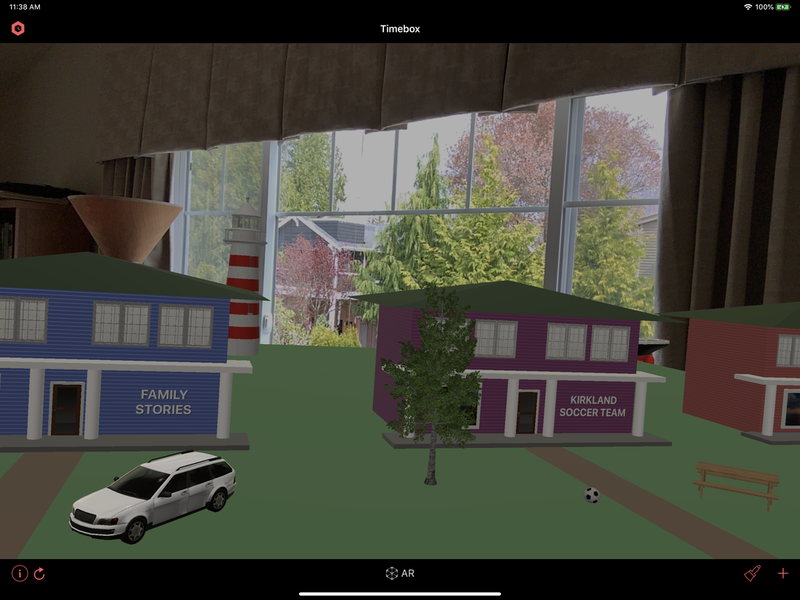 Privately share your own 3D Group Galleries as a unique new way to present your visual stories and collaborate with your family, friends, colleagues and clients. Create and personalize your Gallery. With the + add the Photo Stories from your Photo Library Gallery that everyone wants to see. Invite your friends to visit and see what happens next as everyone adds their Photo Stories to yours creating a long-lasting shared memory. Group galleries are great for anything shared: trips, events, memorials, celebrations, sports, projects and more. Further explore your Galleries in the interactive AR (Augmented Reality) mode by tapping the AR button, holding up your iPad or iPhone and walking around. Be sure to try the fun new Active Photo Frames and play your favorite Photo Stories as slideshows anywhere in your Galleries. Choose from multiple frame shapes, finishes, colors and options. The fact that your privacy is very important to us. None of the data in the Timebox app is ever retained by or visible to our company. There are no extra signups, accounts, passwords, uploading or ads. To participate in the Timebox Beta Test, on your iOS device tap https://testflight.apple.com/join/ZptvvEDk (or one of the red buttons in this post) which will take you through downloading Timebox Photo Galleries via Apple's TestFlight app. If you already have Timebox installed on your device, the Beta Test version will update your current version. If you’re new to Timebox (Welcome! ), please give Timebox permission to access your Photos so they can be displayed in your grid and map Timelines. If your iOS device does not meet these requirements you’ll experience the updated 2D user interface. If you know someone who would also like to try the Timebox Beta Test, please send them the TestFlight link. Once they follow the same steps, you'll both be ready to collaborate in Timebox Group Galleries. Thank you for helping us make a better app! Over the last year, we've been working hard on the next version of Timebox - Timebox Photo Galleries 3D. We’ll be ready to show you more soon but in the meantime here are a few screenshots. Stayed tuned!